Okay. By now--if you've been to this blog before--you know that I like things cooked with olive oil and garlic. A lot. I could eat it in variation nearly every day...and I almost do. 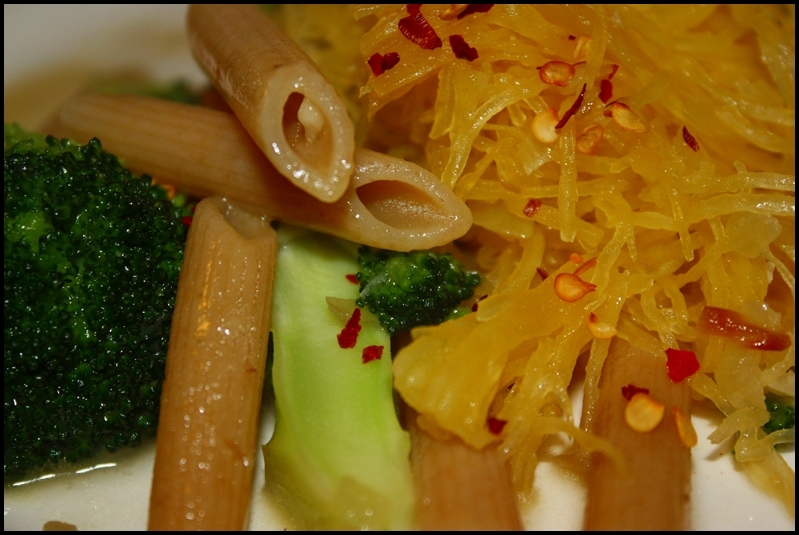 I posted a similar recipe about a month ago but this combo was too good not to share...whole wheat penne with broccoli aglio e olio, layered with spaghetti squash cooked in the same fashion. I also used extra garlic and hot pepper in the recipe and a liberal dousing of Parmesan to finish it. Yum. I just ate but I salivate at it's remembrance. 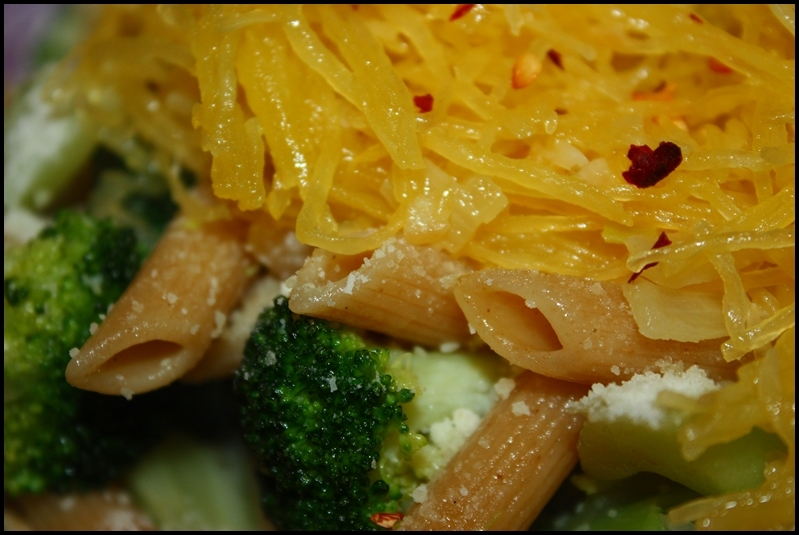 Anyhow, the recipe for the penne and broccoli is below (substitute penne for the spaghetti, and vegetable broth for the chicken broth if you want to keep it vegetarian). To see how to cook, shred, and saute a butternut squash in this fashion (with pics and step-by-step instructions), see this post. For multiple recipes on cooking nearly anything aglio e olio, click here. Cook the spaghetti and drain it. Heat the olive oil in a heavy skillet with the garlic and hot pepper flakes. When the garlic just starts to change color add the chicken broth and salt. Cook the broth for one minute, until it reduces by half, and then add the broccoli. Toss the broccoli for a few minutes. Add the cooked spaghetti, and stir it until thoroughly coated with the other ingredients. Stir in the cheese just before serving.